As power is set to come back to most of Manhattan by midnight tonight, we are hopeful that we can begin to rebuild and recover from Sandy’s devastation. While the Royal Botania showroom, 394 Broadway, is still without electricity, the team is moving forward with their planned party (ironically called After Dark). After all, we could all us some hospitality right about now! They are inviting the industry to join them AFTER HOURS on November 10 from 9PM-2AM. 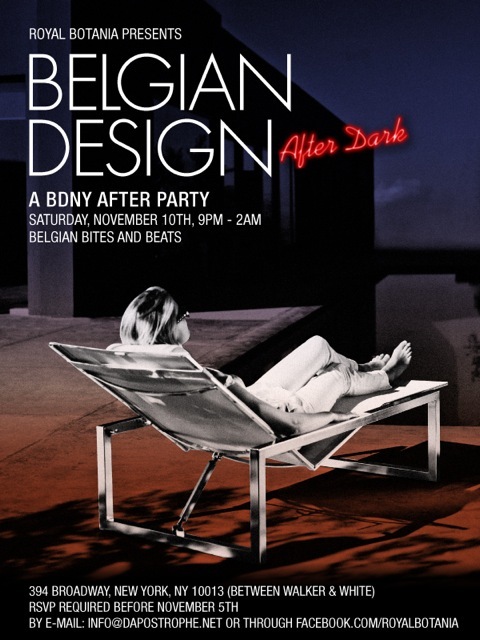 There will be Belgian beer and bites and a DJ to keep the party going all night long. They will also be raising money for the Red Cross. Donate a $1 and grab a red ribbon at the door to show your support. The event kicks off the Boutique Design NY (BDNY) show, which runs from the 11th-12th at the Javits Center North. Look for Royal Botania there too at booth 4462!